Think about cigarette smoking, which has impacted millions of people. For decades, cigarette companies marketed their products in ways that suggested they enhanced human health. Then, as scientists began to study the effects of smoking on human health they discovered many adverse health effects. This information became public as research advanced over time. Nevertheless, the misinformation and incorrect information about the effects of cigarette smoking on human health remained more persuasive than the correct information derived from careful scientific research. Cigarette companies continued to defend their products, but over time the anti-cigarette smoking forces improved their message by simplifying complex research results and relentlessly presenting it to the public. Over time, the public perception of cigarette smoking changed from enhancing human health to harming human health. But, despite all of our efforts, the same has not yet occurred for the practice of management – which also affects millions of people. People still think that conventional management, rooted in batch-and-queue processing, is healthier for a business than Lean management and flow. The image at right illustrates the situation. 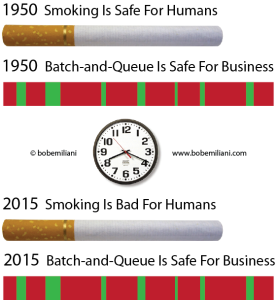 In 1950, smoking was considered safe for humans and batch-and-queue processing was considered safe for business (because of the prevalence of sellers’ markets). Evidence presented to the public over time convinced them that smoking is bad for human health. The Lean community has attempted to present evidence over time of the ill effects of batch-and-queue processing, yet leaders remain unconvinced. In 2015, leaders continue to view batch-and-queue processing as safe and healthy for business when it is not. Batch-and-queue processing adds tremendous risk and leads to unhealthy business when buyers’ markets are prevalent as they are today. And, batch-and-queue processing is not safe for human (employee) health. What we all hoped would have happened as a result of our combined efforts for the last three decades has not yet happened. We have been unsuccessful because our messages have been too complicated, inconsistent, infrequent, and largely unseen by the public. What the anti-smoking community did to change public perception of cigarette smoking, the anti-batch-and-queue (Lean) community must do to change public perception that leadership and management practice rooted in batch-and-queue processing is good for business. We must relentlessly present to the public simple messages derived from complex research to remove bias against Lean (flow). We must provide overwhelming evidence of the harm that conventional management, batch-and-queue processing, has on all key business stakeholders: employees, suppliers, customers, investors, and communities. And we must do so in ways that are easy for anyone to grasp. People respected in the field of Lean management – researchers, professors, experienced Lean leaders, etc. – must repeat these simple messages to the public again and again. It seems that government agencies, non-government organizations, non-profit organizations, others should join together to provide the funding necessary to reach the public. Less waste means better business health, better human health, conservation of resources, more resources available to do good things, and a future where humans can thrive.